When buying a property the list price isn’t all you are going to pay. There are a lot of hidden and extra expenses when it comes to buying a property. Knowing what these expenses are is important to ensure you have enough money to purchase the property and pay for all the extra costs associated with the purchase. 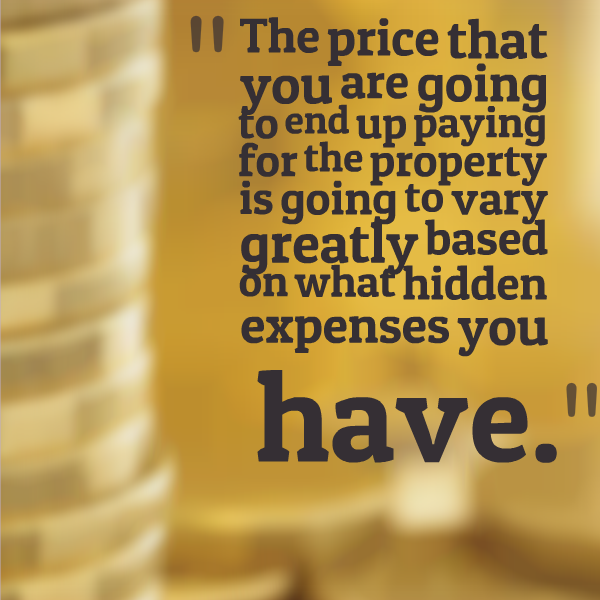 The price that you are going to end up paying for the property is going to vary greatly based on what hidden expenses you have. Just because a property is listed for a certain amount doesn’t mean that is all you are going to have to pay. I want to go into more detail about some of the hidden expenses that you may experience when purchasing a property so you can plan your finances more effectively and understand even better whether or not you can afford to buy that property and if it’s going to be a good investment for you. So let’s have a look at the expenses now. It’s often wise to get what’s known as a building inspection done. This is when a builder comes to your property inspects it, makes sure that the structure is sound and lets you know of any issues that the property has or issues that the property may have in the future. A building inspection’s going to costs you around $400-$500 depending on the builder in the area, but is well worth it because you don’t really want to invest in a property that’s structurally unsound that you going to be throwing lots of money into just to fix it up together into a liveable condition. They are also inspecting the building as to whether you could have these problems in the future. A pest inspections is going to cost you around $300-$400. Hidden expense number three is your accountant and this will probably come in around $500 or maybe a bit less. You need an accountant to do your tax returns and to help you with the finances of your property and managing the tax and so forth associated with that. Not necessarily just at purchase day, but when tax time rolls around. This is probably going to cost you around $200-$500, however in some circumstances the lender that you go with may provide a valuation for you free of charge. The lender is going to need a evaluation to make sure that if you default on your loan the sale of the property will cover the remaining mortgage. It’s cheaper in very urban areas, places like Sydney and when the market’s moving pretty rapidly, because they can do evaluation just from their desk using the Internet. But if you’re out in a rural area they’ll actually have to go to the property and inspect the property so price of the valuation is obviously going to be more. Getting a evaluation done is not something that you have a choice in, but how much you pay it may cost you a couple hundred bucks or you may get it for free. Check with the mortgage broker as to whether it’s good to go with the lender that offers it for free, you can check out my list of mortgage brokers here. Research reports are probably going to cost you around $100-$250. These research report help give you an idea of the value of the property, so it’s going to show you comparable sales, a lot of data and some insight into the suburb that you’re buying in. There are a bunch of different tools out there so the cost is going to vary significantly, I find that the easiest way to do it, if you are going to be looking at a few houses is to sign up for Real Estate Investar (affiliate link). This costs $250 per month or cheaper if you sign up for a long period of time. It allows you to get these reports for basically unlimited amounts of properties. So you could sign up for a week, you can sign up for a month and get access to as many as you want in that time. Or there are some free ways to do it, which I show you in Positive Cash Flow Academy. The cost of LMI varies depending on how large your deposit is and how expensive the property is. LMI is an extra expense which is added to your loan or that you need to pay for and that’s for people who don’t have a 20% deposit or more. So if you have 5% or 10% or 15% deposit you can still go ahead and purchase property, but lenders are going charge you lenders mortgage insurance. This is an expense that you pay to the lender for their increased risk, because they’re taking you on with a smaller deposit. So you don’t actually really don’t get anything for it, apart from the fact that it actually allows you to get a loan. These can range anywhere from $300-$1500 and these are fees that are associated with setting up accounts in order to get your mortgage. Mortgage application fees and so forth or you may even be moving everything over to a new bank, getting a credit card, getting an offset account, which is a separate account, which might have an annual fee as well so there’s a lot of different bank fees that you need to navigate. So again speak to your mortgage broker about how much this is going to cost you so that you can get a rough idea. Not all mortgage brokers are created equal and not all mortgage brokers offer this service for free. A lot of mortgage brokers out there do offer their services for free because they get paid by the banks and by the lender that you choose to sign up with. However not all mortgage brokers work like this and some mortgage brokers do charge you an upfront fee or do charges you some sort of application fee. Talk to your mortgage broker to understand exactly what their fees are. Hidden expense number nine is stamp duty. This ranges from the $1,000’s to $10,000’s and it depends on what state you’re in. It depends on the price of the property and in some cases depends on how large the loan is compared to the price of the property as well. You can’t really escape stamp duty, unless you are purchasing a property that has some sort of state concessions around it. This might be that you’re purchasing a piece of land that you are going to build the house on or a house and land package, or you are buying something off the plan and your state offers concessions where they wave stamp duty. So in some cases stamp duty won’t be there at all but in most cases you going to have to pay stamp duty. And there is a bunch of stamp duty calculators on the Internet that you can go to and check it out to work out what your going be paying roughly anyway. A hidden expense number 10 is your conveyancor fees or your legal fees. This is to manage the contract to get the contract to go through and all of that sort of stuff. If you are not a lawyer then you are going to need to get a conveyancer or solicitor to do this for you. This can range from anywhere from $500 to upwards of $2000. A solicitor is going to cost you more than a conveyancer, but the solicitor is qualified in more aspects of law, whereas a conveyancer only focuses on property law and helps facilitate property deals. For me, I love conveyancers because they’re cheaper and even if it has to be escalated you can take it to a solicitor – but a lot of people do have great relationships with solicitors and prefer to go through them, it’s really up to you which one you want to use. Getting your insurance up and running on your property is a cost you should take into account. This might be landlords insurance or it might be home and contents insurance but there is probably going to be some sort of upfront fee you will have to pay. You are going to have to pay at least the first month or maybe two months in your first hit or you may do it yearly and so you got yearly costs as soon as you purchasing the property. Insurance varies depending on what type of insurance coverage that you opt for. If you’re purchasing and investment property chances are you going to want to get a quantity surveyor in there to assess your property and what you can depreciate over the years. You may be able to depreciate the construction on the building itself or if it’s an older property you can generally only depreciate the interiors known as ‘plant and equipment’. By getting a quantity surveyor in they can assess everything from the carpet to lamp shades, to the curtains, to the building itself , as also how much you can claim each year and this can be great to help you save money on tax. It is going to cost you somewhere around the $300-$700 mark for a quantity surveyor. It’s important to know that depreciation does affect the amount of capital gains tax you will pay when it comes time to sell the property. But it most cases it is still well worth claiming. If you have a buyers agent helping you find a property then they are going to charge you a fee (usually) when it comes to settlement. That fee is anywhere from around 1.5%-2.5% of the purchase price of the property. If you’re looking at a $500,000 property then 1.5% of that is going to be somewhere around $7,500 or if it’s up to 2.5% then it’s obviously going to be about $12,500. It’s not cheap, so when assessing whether or not to get the buyers agent they can help you get a property for a better price they can help you find a property that is better suited to you but they do come at a cost so you need to know that cost is there and you need to factor that in. 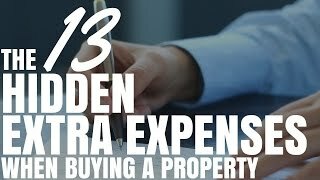 So there you have 13 hidden extra expenses when buying a property. In tomorrow’s episode I’m going to go through some more hidden expenses and we are going to look at the ongoing cost of owning a property and the episode after that we are going to go through the 10 hidden extra cost when you’re selling a property. Now you can know no matter what stage you are at, exactly what your expenses are going to be and you can be and start to get a feel for it.